To help control the risk of antibiotic resistance, dairy farmers and veterinarians are changing the way they use antibiotics at dry off. So, how do we decide which cows should receive antibiotic treatment and how do we reduce our reliance on them? 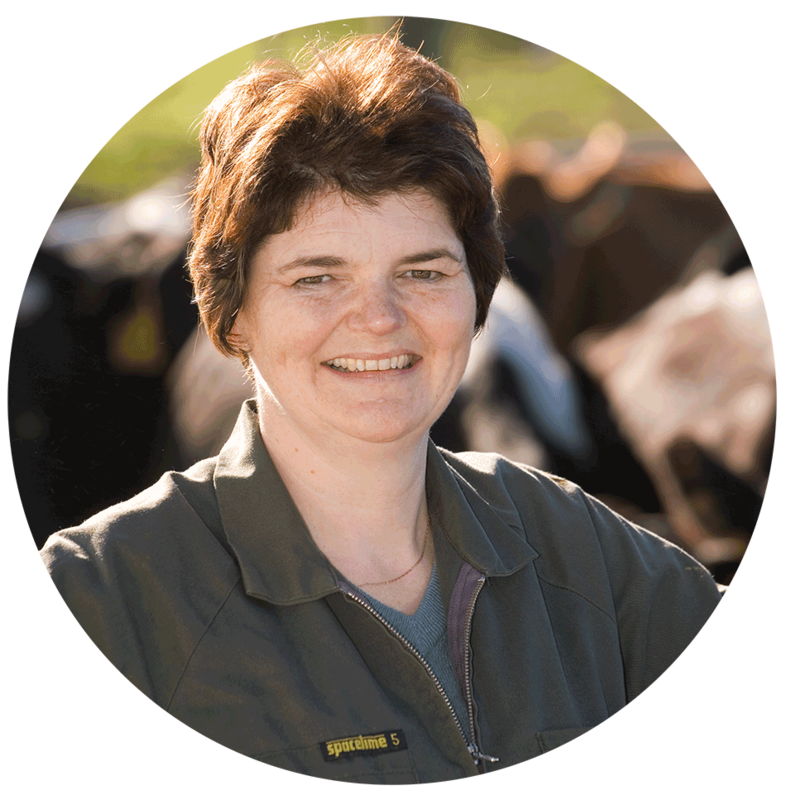 Jane Lacy-Hulbert, animal and feed team leader, DairyNZ. Scott McDougall, research director, Cognosco, Anexa Animal Health. Overuse of antibiotics can increase bacteria resistance: for this and other reasons, vets and farmers should use antibiotics prudently. Herd test somatic cell count is currently the best tool for selecting which cows need antibiotics. achieve these results at least as well as dry cow antibiotics. Pathogens can be introduced into the mammary gland if poor hygiene is used when products are infused. Work with your vet to ensure anyone administering these products receives thorough training first. Concerns have been raised by the medical sector over the past few years about the use of antibiotics in food-producing animals, specifically those antibiotics critical to human health. This is because, however well intentioned, any use of antibiotics increases the risk that bacteria will develop resistance. As reports of people dying from infections caused by multi-drug resistant bacteria increase, the pressure to change the way we use antibiotics, in medicine as well as in agriculture, ramps up. These risks were clearly illustrated in the Netherlands in the late 2000s. At the same time as methicillin-resistant Staphylococcus aureus (MRSA) bacteria became more common in pigs, there was an increase in the number of people presenting at hospital with MRSA-infections. Many of those who showed up at hospital were farmers and vets involved with the pork industry1. When antibiotic use in pig management was scaled back, the rate of MRSA infections declined. Lower rates of antibiotic use in the dairy sector in the Netherlands have since been associated with less antibiotic resistance. Mastitis cases due to Staphylococcus aureus (Staph. aureus) that are resistant to penicillin have been known about in New Zealand for many years, but there’s no evidence that the prevalence of resistance has increased, nor any evidence of MRSA. So far, no New Zealand data associates antibiotic use with resistance in dairy cattle, nor is there any evidence of transmission of resistance (either by bacteria or horizontal gene transfer) from cattle to humans2. However, some evidence is emerging of resistance in gut bacteria3 and this tells us we must be more cautious in the way we use antibiotics. To support a global push towards better stewardship of antibiotics, New Zealand veterinarians recommend dry cow antibiotics be reserved for cows with evidence of bacterial infection. This means, for most herds, it will no longer be appropriate to treat every gland of each cow in a herd with long-acting antibiotics. If you’d like to read about the history behind these changes, refer to Prudent use of dry cow antibiotics - what does this mean?4. Using antibiotics prudently means doing so in a rational and targeted way. It’s about maximising their therapeutic effect and minimising the risk of antibiotic resistance. This includes not using antibiotics unless there is evidence of a need. replacing the use of antibiotics with alternatives, such as immune modulators, vaccines, genetics or solutions such as teat sealants, to better prevent disease. What does this mean for mastitis control? Antibiotics may continue to be used when cows suffer clinical disease. However, it is not prudent to use antibiotics for the prevention of infection in uninfected animals. An example of imprudent use would be giving antibiotic dry cow therapy (DCT) to animals with a low somatic cell count (SCC) at the end of lactation. In most herds, this will mean targeting cows with evidence of infection, and protecting other cows with a non-antibiotic alternative, such as an internal teat sealant. For cows requiring treatment for clinical mastitis, this will mean your vet will place more emphasis on identifying the likely bacteria, and bacterial sensitivity to antibiotics, for cases that typically occur in your herd. Can we still use dry cow antibiotics? Yes, dry cow antibiotics can still be used, but they should be reserved for cows with evidence of infection, such as a history of treatment for clinical mastitis, or a high SCC. For most herds, some of the herd will receive dry cow antibiotics, and then decisions will be necessary on how to treat the remainder of the herd. These decisions must be made with a vet who provides the prescription. The vet must know the health history and environment of your herd. In some situations, vets may still prescribe dry cow antibiotics for all cows, but this will be justified, based on individual cow health records and information relevant to the whole herd. Which cows to treat with dry cow antibiotics? Before you can decide if a cow is eligible for antibiotic DCT, you’ll need to see evidence of bacterial infection. The usual ‘gold standard’ for indicating the presence of bacteria is bacterial culture, carried out in a laboratory. In countries such as Denmark, Finland, Norway and Sweden, evidence of bacterial infection based on culture or DNA analysis is required before DCT is prescribed. Carrying out a farm-based form of bacterial culture has been accepted as a means of detecting infection5. 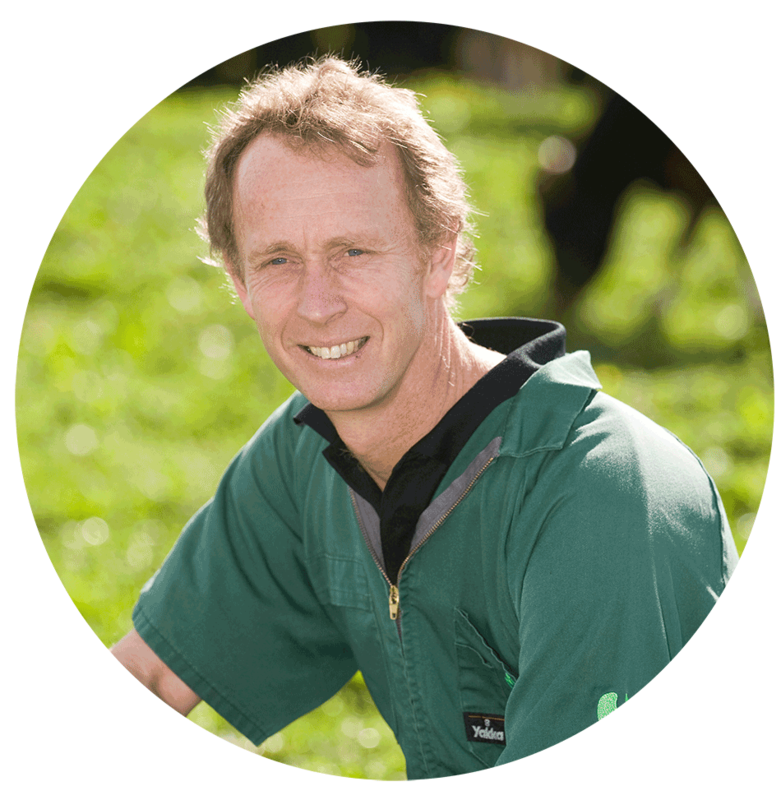 Under New Zealand systems, with seasonal calving, the logistics, time and direct costs make it difficult to hygienically sample all glands of every cow for bacteria culture, before drying off. Instead, we should use indirect tests such as SCC, which are cheaper, easier to implement and have a reasonably high level of accuracy. maximise the number of cows identified as likely to be infected with a major mastitis pathogen, such as Staph. aureus or Streptococcus uberis (Strep. uberis). minimise the likelihood of cows being missed that should receive DCT. enable significant reductions in the amount of antibiotic required. In a multi-herd study in 2017, we tested the connection between individual cow SCC in lactation and the presence of major mastitis pathogens, such as Staph. aureus and Strep. uberis, in individual glands at dry off. Approximately 2500 cows, selected from 36 herds, were milk-sampled at dry off. We compared bacterial culture results with SCC data collected during lactation6. A threshold SCC of greater than 150,000 cells per millilitre of milk (>150,000 cells/mL) within the last 80 days of lactation identified cows likely to be infected, with reasonable accuracy. Approximately 85 percent of the cows considered infected (because they were over the SCC threshold) were truly infected with a major pathogen (i.e. Staph. aureus, Strep. uberis, Escherichia coli), and only 15 percent of truly infected cows were missed. 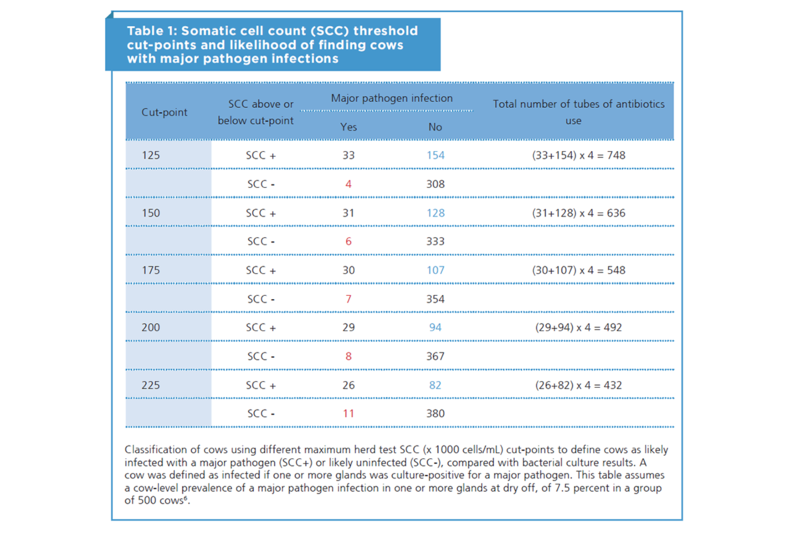 Different thresholds, or SCC cut-points between 125,000 cells/ml and 225,000 cells/ml (Table 1), illustrate the trade-off, between infected cows that miss out on DCT because they are under the SCC threshold, but are actually infected with a major pathogen at dry off (shown in red in Table 1), and uninfected cows that receive DCT because they are over the threshold, but may not actually be infected (shown in blue in Table 1). Nevertheless, increasing the threshold reduced the total amount of antibiotic required, compared with whole herd DCT. There was a 63 percent decline for a cut-point of 125,000 cells/mL, and 78 percent for 225,000 cells/mL. Why are there exceptions to the connection between SCC and infection? Some uninfected cows may have a high SCC, due to a previous infection, low milk yield or infections due to minor mastitis pathogens. The high SCC should resolve over the dry period and these cows are unlikely to benefit from antibiotic treatment. Conversely, some infected cows may be missed due to natural fluctuations in the SCC during an infection, causing the SCC to be below the SCC threshold when tested, or the cow acquires a new infection in the days between herd testing and dry off. Which herd test information best identifies cows for DCT? From DairyNZ’s study6 across 36 herds, we found that a single herd test within the last 80 days of lactation was as accurate as the maximum SCC from three or four tests during lactation, or the average of all herd tests, for detecting cows with a major pathogen infection. For herds that aren’t routinely tested, a single test in late lactation could be sufficient to define cows as infected or not and, therefore, to help farmers decide which cows receive DCT. What happens to infected cows that miss DCT? Across three New Zealand studies on internal teat sealants (ITS)7, there were good outcomes for cows that received ITS at dry off but were already infected. The incidence of clinical mastitis over the dry period was less than two percent of cows, and the bacterial cure rate of these quarters was over 90 percent. These outcomes were equivalent to those achieved for cows where DCT had been used. This illustrates that ITS alone can be an effective way of preventing new infections over the dry period. What should happen to the rest of the herd? 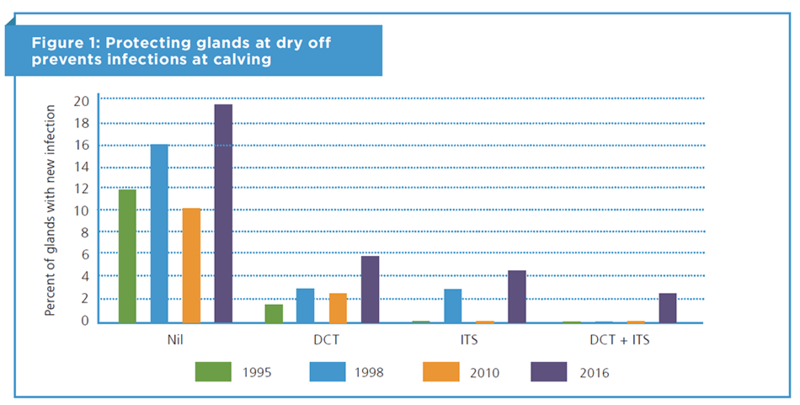 For cows left unprotected at dry off, the rate of new infection during the dry period can be high. Across several studies, this new infection rate varied from nine to 13 percent of glands8-11 (see Figure 1). Infusing an ITS, which contains no antibiotic, at the end of lactation provides a physical barrier inside the teat and can reduce the rate of new infections over the dry period. A meta-analysis indicated a lower new infection rate, and lower clinical mastitis incidence rate in the next lactation, for glands that received ITS infusion compared with no treatment or DCT alone12. The research described in this article was funded by DairyNZ and the Ministry for Primary Industries' Sustainable Farming Fund. Speksnijder, D. C., D. J. Mevius, C. J. M. Bruschke, and J. A. Wagenaar. 2015. Reduction of veterinary antimicrobial use in the Netherlands. The Dutch success model. Zoonoses and Public Health 62(Suppl. 1):79–87.doi: 10.1111/zph.12167. Toombs-Ruane, L. J., J. Benschop, S. Burgess, P. Priest, D. R. Murdoch, and N. P. French. 2017. Multidrug resistant enterobacteriaceae in New Zealand: A current perspective. New Zealand Veterinary Journal 65(2):62-70. doi: 10.1080/00480169.2016.1269621. McDougall, S., E. Cuttance, M. O'Sullivan, M. Bryan, R. Lodder, J. Shelgren, T. Ellingham, D. Scott, J. Williamson, K. Gohary, and J. Lacy-Hulbert. 2017. Predicting infection status at drying off, and the efficacy of internal teat sealants in dairy cows. Pages 35-38 in Proceedings of the Society of Dairy Cattle Veterinarians of the NZVA Annual Conference, VetLearn Foundation. McDougall S. 2010. A randomised, non-inferiority trial of a new cephalonium dry cow therapy. New Zealand Veterinary Journal 58(1):45-58.doi: 10.1080/00480169.2010.65060. Rabiee A. R., and I. J. Lean. 2013. The effect of internal teat sealant products (Teatseal and Orbeseal) on intramammary infection, clinical mastitis, and somatic cell counts in lactating dairy cows: A meta-analysis. Journal of Dairy Science 96(11):6915-6931 doi: 10.3168/jds.2013-6544. Drying off is a key time for mastitis control; decisions made at this time can influence your herd's mastitis performance for the next 6 to 12 months. Want to read more online articles from Technical Series April 2019? Click here.